As it says, anything goes. From a paradise garden in 1888 to the Blitz-stricken streets of wartime London, from a human zoo in the 1970s to an uber-pharmaceutical lab in the distant future, the children of Time and Space are being hunted by a dark and terrible figure. A monster that feeds on their blood, and needs their bones to make its bread... Join us as five actors - the fantabulous Luke Higgins, Chloe Borthwick, Sally Morton, Joshua Young, and Georgia Wilkinson - conjure up a cast of 39 crazed characters throughout ages and across dimensions. Billy, is a normal teenager, living a normal life. today he's just murdered a helpless boy and stuffed his body upstairs but has spilt blood all over his fresh Egyptian cotton sheets. all out of Peroxide Bleach and Lime he heads straight to Sainsburys. His parents arrive from work and soon enough discover the body upstairs and they react..... rather calmly. more focused on the trivias of the day and the lack of Granny Smith Apples in the fruit basket they go about their normal day without a care in the world. Come and see Sophocles' classic play in the Pinter Studio full of tragedy, family drama and sunglasses. The cast is fabulous, the set is atmospheric, the play is very tragic and very Greek. Aine Nettleton, Lizzie Manwaring, Aidan Parsons, Jack Ridley, Beth Christlow, Paulina Musayev, Cameron Szerdy. Emma’s been seeing Darren. She thinks she’s in love. Her boss thinks she’s in breach of contract. The situation needs to be resolved. Set over a series of increasingly bizarre meetings, Contractions is an ink-black comedy that explores the lines between work and play, and what happens when those lines are crossed. Then this play about a failed drama company who want to come back with a bang is the one for you. They are planning a new performance of which includes 4 different artists. An actor, singer, musician and artist. However, since their last performance everyone in the group has being having their own problems which are heavily affecting the performance and nobody knows if it will work out. A devised response to Edward Albee's 'Who's afraid of Virginia Woolf', 'What a Dump!' 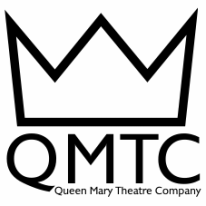 will be closing this year's QMTC End of Season festival, and we would love to see you there!